SF Taxi Media: Credit Card Fees, Cab Companies, And The SFMTA's Waiver. Is the City giving in to big advertisers? By John Han. Credit Card Fees, Cab Companies, And The SFMTA's Waiver. Is the City giving in to big advertisers? By John Han. At the April 5th, 2011 MTA Board meeting, Board Director Malcolm Heinicke said that he had, "more questions than answers", after hearing many of the drivers protest credit fees and other issues. Director Heinicke may not be aware that most likely, his is not an isolated sentiment. At that SF Municipal Transportation Agency Board meeting (SFMTA), 50-60 or so San Francisco taxi drivers led by driver Tariq Mehmood protested the fees and electronic waybills. Regardless of varied opinions over Mr. Mehmood and those drivers' action, their action resulted in MTA Board president Nathaniel Ford moving to schedule town hall meetings to further discuss the matters in a public setting. No dates have been announced yet for those meetings. Even despite public meetings though, the 5% charge backs are expected to stand, regardless of outcome of any public forum discussions. Meanwhile, a May 17th MTA Board meeting is scheduled to discuss a taxi meter rate increase. Even in leu of a possible meter increase, many drivers remain frustrated… and some even furious. With regards to 5% credit card fees, SF Transportation Code Section 1106(p)(6) says cab companies must cash credit card payments for their taxi drivers, and prohibits the companies from charging the drivers back for the processing fees. However, with passengers’ increased use of credit cards to pay for fares, companies’ costs have risen while their gate fee and advertising revenues have remained the same. Therefore, in July of 2010, the MTA Board considered and authorized SFMTA Taxi Services to waive that prohibition. In a final memorandum dated October 15, 2010, Taxi Services Deputy Director Christiane Hayashi detailed the criteria that companies must follow in order to qualify for the waiver. It includes two key features - the ability to produce electronic waybills, and the installation of rear seat payment terminals or “Taxi Tvs” as they’re referred to in New York. The rear seat terminals will allow passengers to pay with credit cards from the rear seat, but will also display repetitive, looping advertisements at whomever is in the rear seat, as well as public announcements. The result of this, is from now on, drivers will pay a 5% fee on all fares paid for by passengers using their credit cards. The 5% will most likely cover part of the costs to purchase the machines themselves, their initial installations, and definitely the credit card processing fees to the service provider. The drivers therefore, will pay for the costs that will qualify their companies, to pass the fees down onto them. However, there is one widely known company taking exception – Green Cab is not participating in the waiver at this time and says it will not install the Tvs, or pass its fees onto its drivers. As an example, it is roughly estimated that Yellow Cab, the City’s largest cab company with over 1/3rd of the City’s medallions, will increase its revenue by $1 million a year in the form of savings, by not having to absorb the credit card fees any longer. Since Yellow is a Co-op owned by medallion holders, those new savings could be divided up between the company’s shareholders. The shareholders, being the medallion holders, may get to keep that money, and maybe offer some of it to attract new medallion holders to the company, thus grow their company, or invest in some other way. But whatever purpose, the companies cost savings are a major advantage... a leg up. In order for cab companies to qualify for their waiver, they are required to contract with a third party service provider. The same New York Times article reports that businesses in New York are beginning to see the value in a taxi's captive audience, and that agencies are looking to expand advertising into markets like Boston, Chicago, and Miami. (San Francisco?) Another New York publication, the New York Observer, taking a different angle makes the following observation. "Cab riders are the ideal advertiser audience: affluent, too lazy to turn off the screen, and captive. No other medium could force New Yorkers to watch that sunny retro-hipster Tommy Hilfiger ad a thousand times with Vampire Weekend's "Holiday" popping in the background. Meanwhile, for taxi drivers, not only will medallion holders and non-medallion drivers alike assume the new costs for the credit card fees (typically 2.75%-3%? ), drivers will also pay the extra to subsidize the purchase of rear seat TVs', initial installation costs, and most likely, the ongoing maintenance. Therefore, it is clear that the MTA will force cab drivers to partially bear the costs to initially purchase, install, and then continue to subsidize the equipment that it is requiring of cab companies, in order to qualify those companies to legally pass through the 5% fees onto those drivers. That information was put on an email to undisclosed recipients, but was not published on the memo. And that is part of why cab drivers are furious. This concludes the first portion of this two part essay. 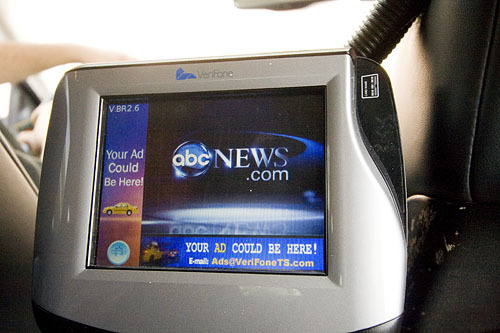 In the second segment, Taxi Tv's will be looked at further with respects to what some cab companies are saying about them, their tip prompters, and the public ridership. Note: No date has been announced yet for any town hall meetings regarding these issues. If drivers are self-employed, running their own business, then they should choose their own service provider. Forcing a third party vendor on a business owner goes against ANTI-MONOPOLY laws. In addition, To Err Is Human and no Human are faultless. By GPS monitoring every click and every move of the cab driver (unlike any other business), we would be going against driver’s constitutional rights, the privilege against self-incrimination. Look up the Fifth Amendment to the United States Constitution. Respectfully, the terms we use tend to "set the terms." I abhor describing BANK CARDS as anything other than BANK CARDS. ATM and Credit Cards are BANK CARDS. And, ladies and gentlemen, it is INDEED the HUGE BANK, the world over that is our problem. Their twin sisters and brothers are software engineering firms run a close second. These concerns make their MONEY by working closely with THE BANKS, and of course, surveillance. These days what government institution that doesn't just love surveillance? Please, let us be partisan, and say instead BANK CARDS. After all, haven't we seen the problem with using credit yet, whose terms are made to be modified at the whim by Banks yet? my government, and so forth? One other comment here, about THE COLONIZATION OF SAN FRANCISCO, and the usurpation of sovereign control. To compare New York with San Francisco, and have this go unchallenged is a fool's errand. Let us,the drivers in S. F. set the terms of debate, OK? We're the one's doing the work. Who cares about what New York does? California is where trends are set for the good. As I have stated elsewhere on this blog somewhere buried, New York is not San Francisco. If I liked New York so much, I'd go there. I know where it is. To the point about problems with these detracting-forever-glowing-monstrosities to be placed in the back of taxi, without say-so of the drivers. One, they are dangerous. They will force the drivers to forever more park and stop where they shouldn't, thereby insuring the chances they'll be receiving more tickets. time he/she has to make money when he/she can. Eventually, the end-user, will feel it, too. Remember, New York City, is huge compared to the density of S.F. Is anyone listening? there about how much money you're making are just that: FOOLS. By lending favor to this absurdity about the upper most that can be made IS THE BEST way to shot yourself squarely between the eyes. Does the boss ever brag about how much he makes? How can you be so nearsighted not to see that you flatter yourself AGAINST YOUR SELF INTEREST. Please, keep how much you make to yourself, if you make a lot. Repeating that some few make.... Well, how much does it cost to buy a house in San Francisco? By the way, to you MATURE ADULTS out there, the last thing that we need is for people, in general, not to be paying attention to their surroundings. We don't need any more of these devices in our faces hawking stuff that we didn't ask for. What about a world where there is NO ADVERTISING at all? Ever dream of it? I do. This is what I'd hope for San Francisco, less corporate garbage, more human contact, and more art. How 'bout that New York lovers, you? where money and profit is everything to San Francisco, where money isn't..., or not yet. Is it to late already. Maybe so. One of the drivers, who is my friend, participated in the demonstration. Because he could not pick up his taxi before the start of his his shift, and he was in his personal car, a police officer singled him out and gave him a ticket. This appears to be totally unjustifiable as anyone, including a sympather could participate and show his support for the cause of the drivers. Great quality of information shared by you,payment through credit cared is become a more popular,Personally i like your post. long airport taxi queue after a tiring flight or dependant on the local Malaga buses to deliver you to your hotel or holiday accommodation transfers from malaga airport .